Rubber B | Rolex and Panerai Watch Bands - The Ultimate Rubber Strap. The Rolex Yacht-Master II Reference 116680 is the one Rolex that screams for attention. Unlike the submariner, or GMT or nearly any other Rolex, the Yacht-Master II demands a second, third, and more looks from anyone that sees it on your wrist. The dark ocean blue “Command” bezel with the 0- 10 markings gives the watch a beautiful color and unique functionality. 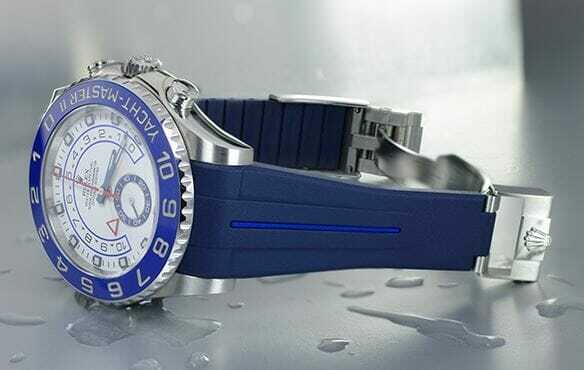 The bezel is tied to the internal mechanical movement allowing the Yacht owner to set and synchronize the timing of race start times and countdown. Unlike other timepieces the bezel is not an independent mechanism. It is part of a functional masterpiece, designed by Rolex, undermining the underlying complexity with its simple beauty. The Yacht-Master II has a white dial, and touches of the Red, White and Blue throughout. The hour markers are white markers surrounded by steel and painted with Chromalight, providing long-lasting blue luminescence in the dark. The new Yacht-Master II has a large triangular hour marker at 12 o’clock and a large rectangle at 6 o’clock. Luminescent paint also appears on the hour minute and seconds markers as well as the 10 minute countdown hand. The 44 mm case is built from Oystersteel, a 904L alloy oftent used in aerospace and high-tech situations because of its resistance to corrosion and its ability maintain beauty even in the harshest environments. The Rolex Yacht-Master II is powered by a calibre 4161 self-winding movement. This is the result of over 35,000 hours of development, patented functions and 360 components. This new caliber supports 72 hours of power reserve. The timepiece also supports a waterproof depth of 330 feet. Blue Band from Rubber – with blue vulchromatic stripe supports the Rolex clasp Rubber B has designed 3 dual colored rubber straps. These are engineered to fit the Rolex Yachtmaster II and the Oyster deployment buckle. 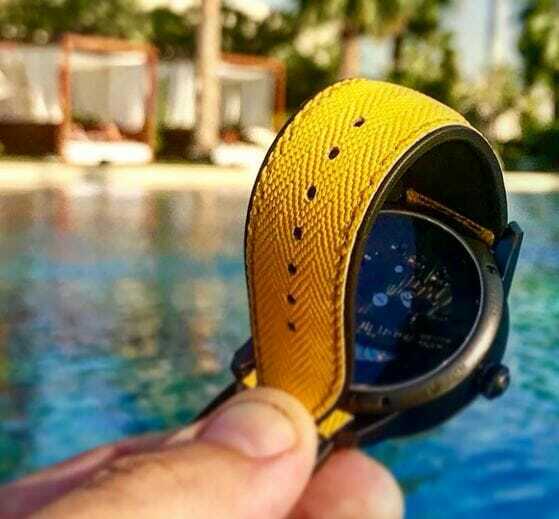 The strap utilizes “Blocked Integration” so it provides a flawless, motionless flush mount to the watch case. 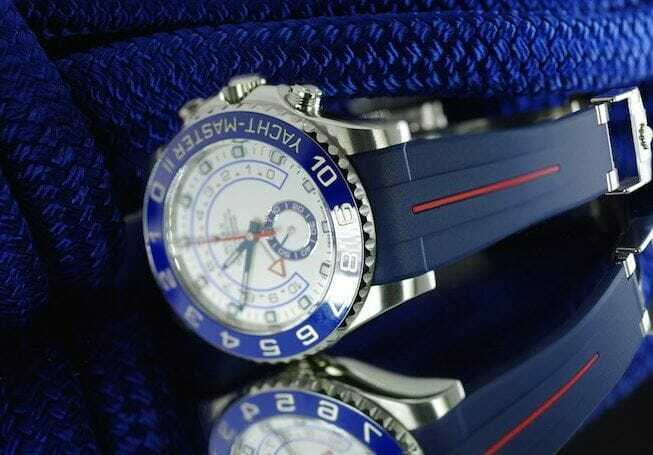 The Blue Band can be selected with either a Red, White or Blue stripe – tying together the beautiful coloring of the Yacht-Master II color scheme. All Rubber B products are made in Switzerland of pure vulcanized rubber. No coatings, blends or bonding is used in the manufacturing process. For more information visit our page here. This entry was posted in All Posts, Rolex Watch Articles and tagged Unique Designer Bands for the Rolex Yacht-Master II on April 15, 2019 by Chris Cardillo. 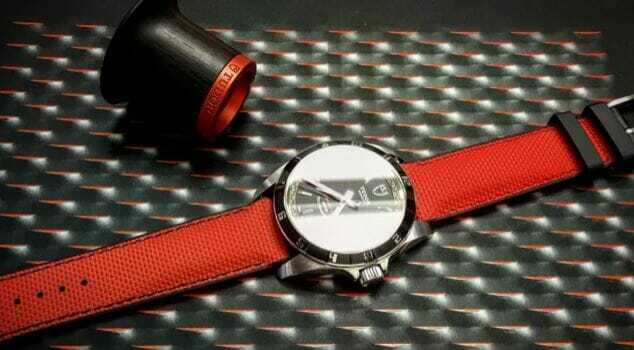 Rubber B has launched a new line of Vulcanized rubber watch bands which is a totally new way of thinking about designer watch bands. Several years ago, Rubber B was the first brand to come to the market with a perfected Vulcanized Rubber band to tightly integrate with specific designer watches from Rolex to AP, Tudor, Panerai and more. They shocked the world of horology with their Velcro watch band and made significant advances in rubber band technology. However, this new release is bound to make waves like no other in the horological world. Now you have the ability to customize your Vulcanized rubber watch band with 17 vibrant and beautiful colors. You can even choose 17 different stitching colors for an added flair. There are 12 patterns to choose from – to satisfy nearly anyone’s taste. Some standard favorites are Alligator, Jeans, Nato and Ballistic. There are 3 lug width sizes – 18mm, 20 mm, and 22 mm to fit almost any timepiece in the world. Although some rare timepieces come with odd numbered lug widths such as 19mm or 23mm, it is easy to size down to the closest width and it will still look spectacular. After you have selected all of the basic colors for your unique piece of horological art, you can opt for a silver or gold tang buckle. 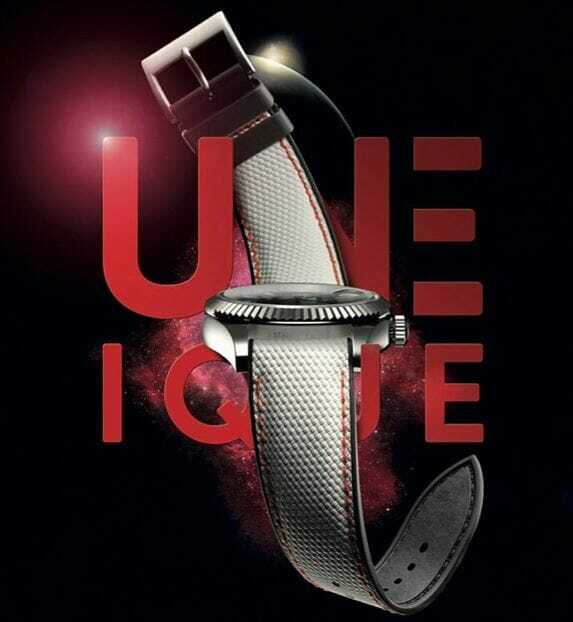 As if that wasn’t spectacular enough, Rubber B has added the ability to personalize your timepiece with text. So, no matter if it is a gift to a special someone, a corporate gift to an employee or client, or if you would like to commemorate your own name, favorite team, character or phrase, now you can. All of these bands are made from 100% Vulcanized rubber and are made in Switzerland with the same care and precision that you are used to with all Rubber B products. Start your journey today at the new website here. This entry was posted in All Posts and tagged Customize Your Bracelet With Colors, Stitching and Personalization on April 15, 2019 by Chris Cardillo. 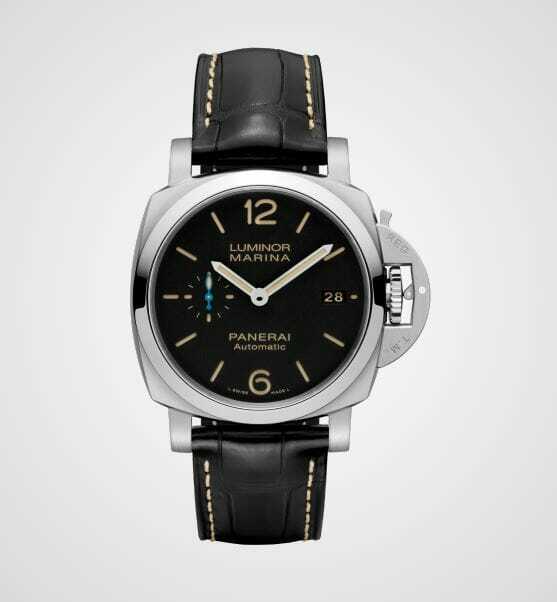 The Panerai Luminor Marina 42mm Reference PAM01523 has a classic white dial with black Arabic numerals and large Arabic numerals at the 12 and 6 o’clock positions. The date aperture appears at the 3 o’clock position. There is a small seconds dial at the 9 o’clock position. Around the dial are luminescent dots – one each for each hour position and two at the 12 o’clock position. Luminescent material is also employed on the hour, minute and small seconds hand. The small seconds hand on the Reference PAM01523 is a bright and cheery sky blue color, while the hour and minute hands are a jet black color that matches the Arabic numeral coloring. The PAM01523 is made from AISI 316L stainless steel. The case is a substantial 42mm in diameter. The bezel is beautifully polished. One of the most characteristic features of the Panerai timepiece is the lock on the winding crown, which provides added security to the crown and provides additional pressure to the waterproofness system. The PAM01523 comes with a brown leather strap. Rubber B has developed 6 Vulcanized Rubber straps engineered to fit Panerai 40mm and 42mm cases (22mm lug space) and their OEM tang buckles. The Rubber B “SwimSkin” is an exclusive patented design which looks like leather (Alligator) or fabric (Ballistic) but is actually 100% rubber and is therefore waterproof for all aquatic activities. All Rubber B bands are made in Switzerland of pure vulcanized rubber. No coatings, blends or bonding is used in the manufacturing of these timepieces. For more information visit our page here. 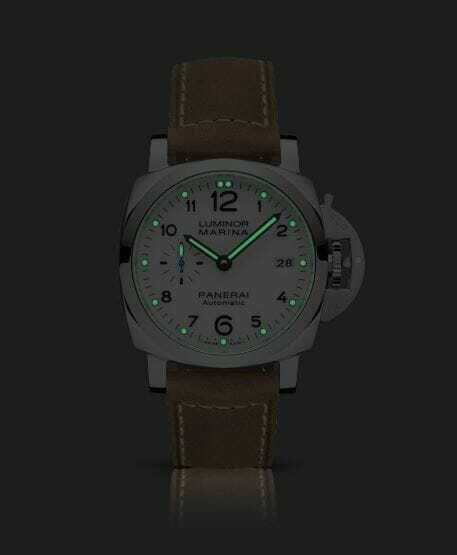 This entry was posted in All Posts, Panerai Watch Articles and tagged 6 New Watch Bands for the Panerai Luminor Marina PAM01523 on March 23, 2019 by Chris Cardillo. The Rolex Milgauss 116400V is powered by an automatic 3131 movement and has a green sapphire crystal. The green coloring of the crystal can be seen on the edges of the crystal as it connects to the polished steel bezel. 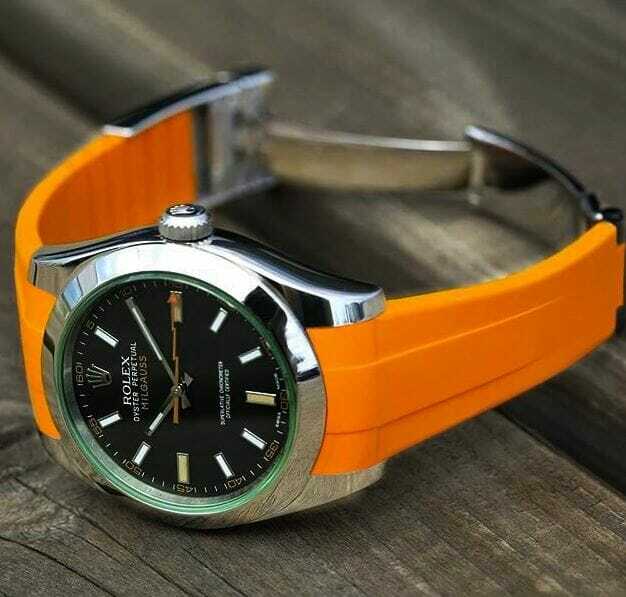 The coloring of the Milgauss is unique among Rolex timepieces. The black dial is adorned with hour markers – mostly white except for the orange markers at 3, 6 and 9 o’clock. The seconds notation is marked around the edge of the dial in orange. The hour and minute hands are a unique extension of the luminescent hour markers – utilizing a similar rectangular shape as opposed to the typical sword shape of most Rolex hour and minute hands. Even more surprising is the orange lightning bolt for the seconds hand. Combined with the complimentary green glow of the Glace Verte sapphire crystal the orange-green combination provides a unique and sporty look. The 40 mm case is smaller than some Rolex timpieces but substantial enough to fit nearly any wrist. The most powerful feature of the Milgauss is the soft-iron faraday cage that helps it resist up to 1,000 gauss (Mille is the French word for thousand – giving the timepiece its name: Mille – Gauss). 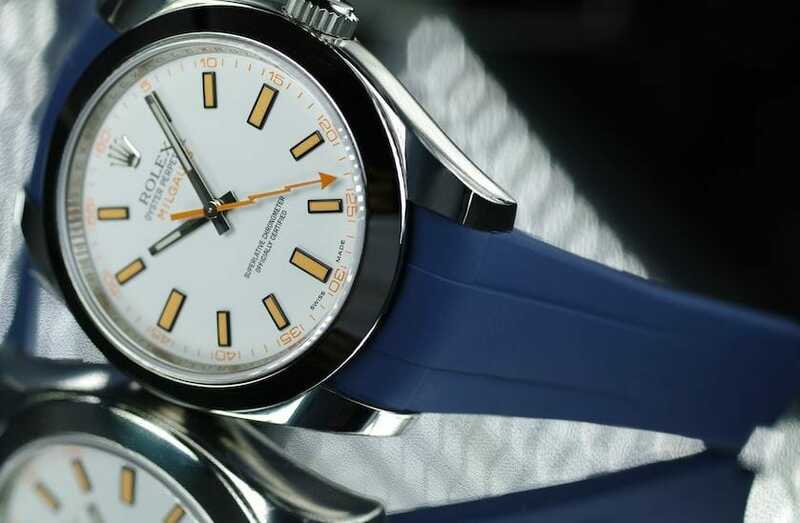 The Milgauss was designed to meet the demands of the scientific community whose timepieces would often be affected negatively by magnetic interference. It became the standard timepiece for the European Oranization for Nuclear Research (CERN) in Geneva. The Milgauss is more than just a tool. It is an exceptional example of Rolex timeless dedication to precision and the art of keeping accurate time under any circumstances. Rubber B has designed 7 exquisite vulcanized Rubber strap engineered to fit Rolex Milgauss 40mm case and deployant buckle. This strap utilizes “Blocked Integration” engineering, incorporating solid inserts for a flawless, motionless flush mount to the watch case. All Rubber B bands are made 100% in Switzerland of pure vulcanized rubber, by leaders in the luxury horology industry. No coating, blends or bonding is used in the production. For more information and to see sample pictures of all our bands for the Rolex Milgauss, please visit our page here. This entry was posted in All Posts, Rolex Watch Articles and tagged 7 Exquisite Watch Bands for the Rolex Milgauss 40mm Reference 116400V on March 22, 2019 by Chris Cardillo. 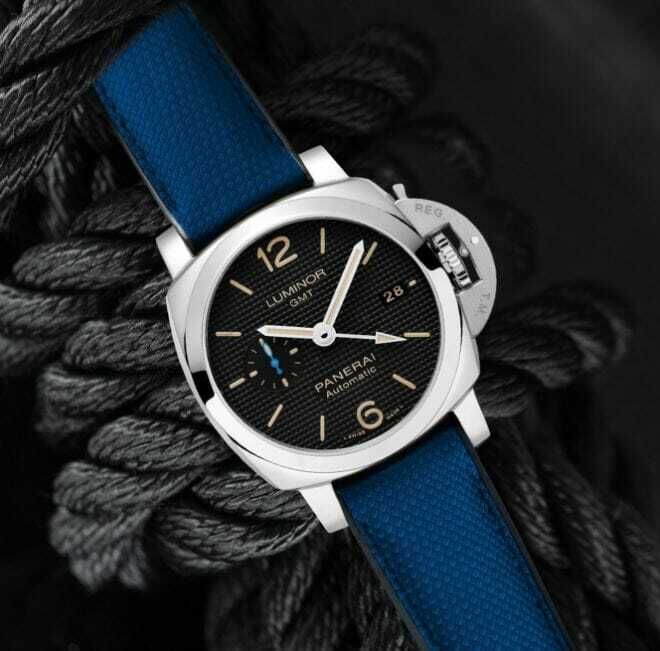 The Panerai Luminor Marina reference PAM01382 is a sophisticated timepiece with a beautiful black dial with lumonous Arabic numerals and arabic hour markers. It has a date window at the 3 o’clock position and a small seconds at the 9 o’clock position. The polished steel case is 42mm in diameter and made out of AISA 316L brushed steel. 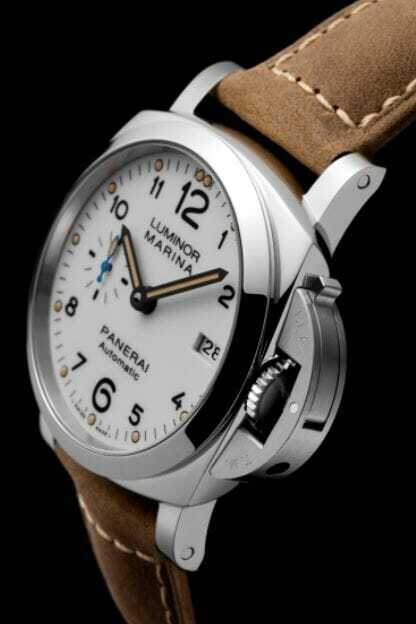 Panerai watches were created for the Italian Navy. The 316L steel is made to be highly resistant to corrosion and hypoallergenic when in contact with the skin. This material resists the extreme environmental conditions that the yachting public and naval professionals come into contact with. The timepiece is powered by a calibre P.9010, utilizing 31 jewels a Clucydur balance and an Incabloc anti-shock device. It provides 3 days of power reserve and a water resistance to 100 meters. The exceptional luminous material provides a powerful green glow on the hour, minute and seconds hands as well as on the hour markers. Additional markings and luminous material is used to indicate the small seconds dial at 15, 30, 45 and 60 seconds. Luminous hour markers also appear at the 9 and 3 o’clock positions – which are often displaced on other timepieces because of the date and small seconds. 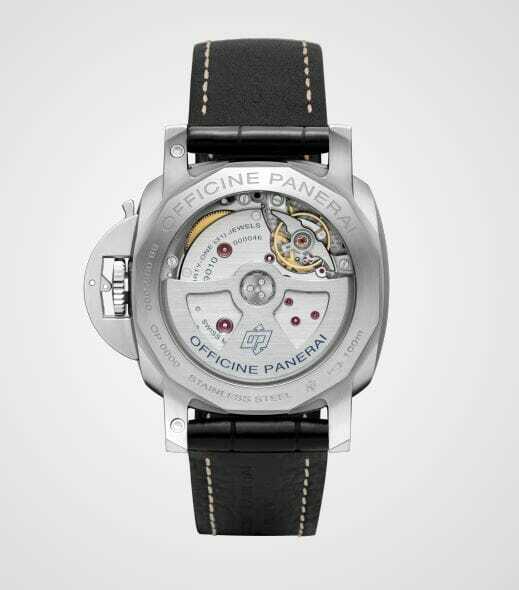 There is a sapphire crystal that covers both the front and the back side of the reference PAM01382. The timepiece comes with a black strap with beige stitching that matches the daytime hour markings and Arabic numerals. 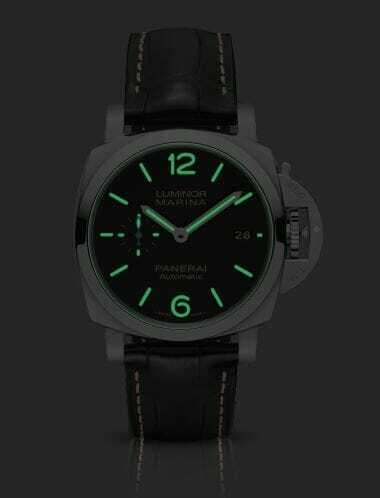 This entry was posted in All Posts, Panerai Watch Articles and tagged 6 Designer Bands for the Panerai Luminor Marina Reference PAM01392 on March 22, 2019 by Chris Cardillo. We are not affiliated with Rolex SA, Richemont SA, or any other watch brand company. All watches, likeness, and logos are trademarks or registered trademarks of Rolex SA, and Richemont SA, respectively.